Background: Pancytopenia is a descriptive term referring to reduction in all three blood cell lineages: erythrocytes, leukocytes and platelets. A spectrum of primary and secondary disorders affecting the bone marrow may manifest with pancytopenia. The present study was carried out to know the morphological spectrum of bone marrow in pancytopenia patients and also to evaluate the causes of pancytopenia with the help of bone marrow examination. Methods: A prospective observational study was done for a period of 18 months that included 77 pancytopenia patients diagnosed based on haemoglobin concentration, total leukocyte count and platelet count. Detailed clinical history, haematological findings, radiological findings, serological and biochemical findings were taken as and when required for all the patients. Bone marrow aspiration and/or biopsy were done in all patients to assess the morphology of bone marrow and causes of pancytopenia. Results: The age distribution in 77 cases ranged from 18 months to 80 years. The most common affected age group was 31-45 years. The males were affected more commonly than females with M:F ratio of 1.7:1. The various causes of pancytopenia were megaloblastic anemia (64.9%), HIV associated dysplasia (15.6%), mixed nutritional deficiency anemia (5.2%), aplastic anemia (5.2%), acute myeloid leukemia (2.6%), idiopathic thrombocytopenic purpura (2.6%), myelofibrosis (1.3%) acute lymphoblastic leukemia (1.3%) and myelodysplastic syndrome (1.3%). The most common bone marrow finding was erythroid hyperplasia with megaloblastic maturation. Conclusion: Pancytopenia should be suspected on clinical grounds in patients with decreased appetite, weakness, prolonged fever and tendency to bleed. Detailed primary haematological investigations coupled with bone marrow examination were vital in establishing diagnosis in pancytopenia patients. A large proportion of pancytopenia was attributable to megaloblastic anemia which was amenable to treatment. Hence, early and accurate diagnosis is lifesaving. 1. Gayathri BN, Rao KS. Pancytopenia – A Clinico Hematological Study. J Lab Physicians. 2011; 3(1):15-20. 2. Khunger JM, Arulselvi S, Sharma U, Ranga S, Talib VH. Pancytopenia – A clinic – hematological study of 200 cases. Indian J Pathol Microbiol. 2002; 45(3):375-79. 3. Khodke K, Marwah S, Buxi G, Yadav RB, Chatuvedi NK. Bone marrow examination in cases of pancytopenia. J Indian Acad Clin Med. 2001;2:55-9. 4. Thakkar BB, Bhavsar UN, Trivedi NJ, Agnihotri AS. A study of Pncytopenia in adult patients more than 12 years of age in North West region of Saurashtra. Nat J Med Research. 2013; 3(1): 48-52. 5. Metikurke SH, Rashmi K, Bhavika R. Correlation of bone marrow aspirate, biopsies and touch imprint findings in pancytopenia. J Hematol. 2013;2(1):8-13. 6. Patakh R, Jha A, Sayami G. Evaluation of bone marrow in patients with pancytopenia. J Pathol Nepal. 2012; 2:265-71. 7. Gupta M, Chandna A, Kumar S, Kataria SP, Hasija S, Singh G, Sen R. Clinicohematological profile of pancytopenia: A study from a tertiary care hospital. Dicle Med J. 2016; 43(1): 5-11. 8. Vaidya S. Evaluation of bone marrow in cases of pancytopenia in a tertiary care hospital. J Pathol Nepal. 2015; 5:691-5. 9. Hamid GA, Shukry SAR. Patterns of pancytopenia in Yemen. Turk J Hematol. 2008; 25:71-4. 10. Sale SM, Mane VP, Pawar VR, Mohite SN, Dhaka V. Clinical correlation of pancytopenia with bone marrow study in a tertiary hospital. Indian J Pathol Oncol. 2016; 3(2): 247-54. 11. Dubey SRK, Patel SK, Arya AK, Singh RP. Clinico-etiological spectrum of pancytopenia in hospitalised children. Internatl J Contemporary Pediatr. 2016; 3(1): 169-172. 12. Jan AZ, Zahid B, Ahmad S, Gul Z. Pancytopenia in children: A 6-year spectrum of patients admitted to pediatric department of Rehman Medical Institute, Peshawar. Pak J Med Sci. 2013; 29(5):1153-7. 13. Nigam RK, Chaudhary R, Malik R, Gour D, Shrivastava A, Tripathi A, Ahirwar R, Jain R. Pancytopenia- Clinico-hematological studies of bone marrow examination. J Evolution Medl Dentl Sci. 2013; 2(47): 9213-9. 14. Tilak V, Jain Raini. Pancytopenia – A clinico-hematologic analysis of 77 cases. Indian J Pathol Microbiol. 1999; 42(4): 399-404. 15. Kumar DB, Raghupathi AR. Clinicohematological analysis of pancytopenia: Study in a tertiary care centre. Basic and Applied Pathol. 2012;5:19-21. 16. Naizi M, Raziq F. The incidence of underlying pathology in pancytopenia: an experience of 89 cases. J Postgrad Med Inst. 2014; 18:76-9. 17. Naseem S, Varma N, Das R, Ahluwalia J, Sachdeva MU, Marawaha RK. Pediatric patients with bicytopenia/pancytopenia:review of etilogies and clinico-hematological profile at a tertiary centre. Indian J Pathol Microbiol 2011; 54: 75-80. 18. Jha A, Sayami G, Adhikari RC, Panta AD, Jha R. Bone marrow examination in cases of pancytopenia. J Nepal Med Assoc. 2008; 47(169): 12-7. 19. Premkumar M, Gupta N, Singh T, Velpandian T. Cobalamin and folic acid status in relation to the etiopathogenesis of pancytopenia in adults at a tertiary care centre in North India. Anemia.2012; 2012:1-12. 20. Santiago-Rodriguez EJ, Mayor AM, Fernandez-Santos DM, Hunter-Mellado RF. Profile of HIV-Infected Hispanics with pancytopenia. Internatl J Enivironmental Research And Public Health. 2016;13:1-7. 21. Opie J. Hematological complications of HIV infection. South African Med J. 2012; 102(6): 465-8. 22. 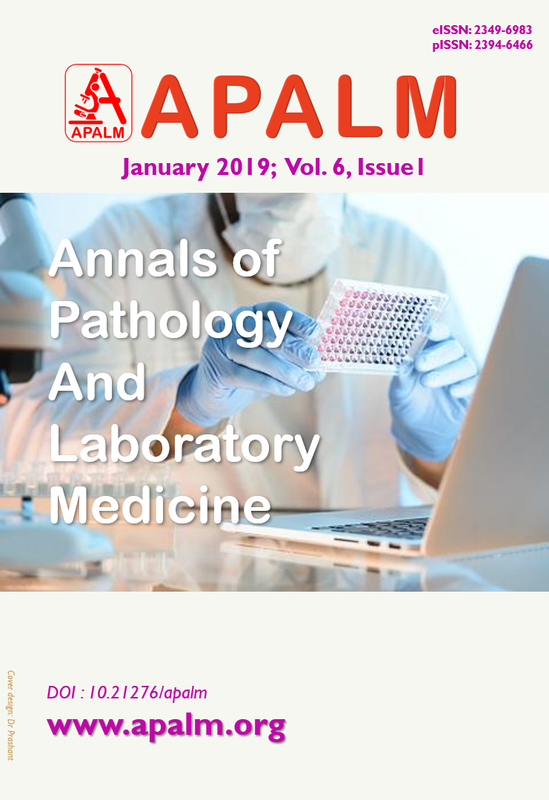 Gandhi PB, Shankar T, Pasha MA, Gouri M. Etiological and clinical spectrum of pancytopenia based on bone marrow examination and case records: A retrospective study. Annals of Applied Bio-Sci. 2016;3(1): 27-32. 23. Santra G, Das BK. A cross-sectional study of the clinical profile and aetiological spectrum of pancytopenia in a tertiary care centre. Singapore Medical J. 2010; 51(10): 806-12. 24. Rathod GB, Alwani M, Patel H, Jain A. Clinico-hematological analysis of pancytopenia in pediatric patients of tertiary care hospital. Internatl Archives of Integrated Med. 2015; 2(11): 15-19. 25. Khan FS, Hasan RF. Bone marrow examination of pancytopenic children. J Pak Med Assoc. 2012; 62(7): 660-3. 26. Memon S, Shaikh S, Nizamani AA. Etiological spectrum of pancytopenia based on bone marrow examination in children. J Coll Physicians Surgeons Pak. 2008; 18(3): 163-7. 27. Rehmani TH, Arif M, Haider S, Arif S, Ahmad R, Saeed M. Spectrum of pancytopenia; A tertiary care experience. Professional Med J. 2016; 23(5): 620-6. 28. Pine M, Walter AW. Pancytopenia in hospitalised children. A five year review. J Pediatr Hematol Oncol. 2010; 32:192-4. 29. Al-Awadi NB, Al-Awad AS, Al-yasiri HH. Patterns of Pancytopenia according to the cause in Babylon. Med J Babylon.2009; 6(4): 434-40. 30. Pereira ADS, Dias A. Hematological Analysis of pancytopenia: A prospective study. Internatl J Scientific Study. 2016;4(4): 71-8.